The Haka is iconic throughout the world. If you’re interested in rugby, then you probably know that the All Blacks perform a haka at the start of each of the rugby games. But, did you know why they do it? There are multiple reasons; and it comes back to the fact that the haka is important to the indigenous people of New Zealand; the Māori. It is an important, iconic part of their history and traditions. Today we are going to continue our blog series on Māori culture by looking at the meaning and significance of the haka. 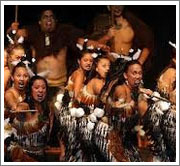 The first hakas were created and performed by different Māori tribes as a war dance. It is an ancestral war cry. It was performed on the battlefields for two reasons. Firstly, it was done to scare their opponents; the warriors would use aggressive facial expressions such as bulging eyes and poking of their tongues. They would grunt and cry in an intimidating way, while beating and waving their weapons. The second reason they did this was for their own morale; they believed that they were calling upon the god of war to help them win the battle. They were heavily choreographed and performed in time. It gave them courage and strength. This type of haka is called a peruperu haka. Overtime, the haka evolved and it came to be used for more than just battles. It became a way for communities to come together and it was a symbol for community and strength. This type of haka is called a ngeri haka. Unlike the peruperu, the ngeri does not use weapons. Their purpose is different; they are performed to simply move the performs and viewers physiologically, rather than to cause fear. This different goal is reflected in the way that they are performed. Their movements are more free, giving each participant the freedom to express themselves in their own movements. 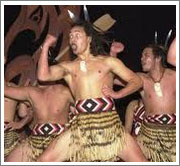 Both males and females can perform a haka; there are special ones that have been created just for women. In New Zealand, you will find that the haka is performed for a lot of different reasons. Nationally, it is used at important events; an example of this is rugby games where it is performed at the start of each match. It is also performed for personal reasons, too. It is performed at weddings, funerals, local events and times when a display of respect and solidarity is required.towards special guests. It is not exclusive to Māori; anyone is welcome to perform a haka, given that it is performed with all the seriousness and respect that it deserves and that the performers are aware of what they are doing and what it means. While our guests are on tour with us, we teach them a haka. And of course, the Haka is synonymous with New Zealand, When our adventure tour company started we wanted to reflect our purpose of fostering deeper connections between our manuhiri (guests), our land and our culture through exceptional travel experiences, and we wanted a name that was truly reflective of this purpose and the cultural education that underpins all our tours. All our tours – whether they are ski, adventure, or mountain bike tours of New Zealand – include aspects of Māori culture. thank you for sharing ,I did’nt know a thing about it..! Thanks for the information. I love this! The first time I saw the Haka was when it was performed by a rugby team on TV, it was decades ago. From over eleven thousand miles away I was moved to tears; I was proud of them for being proud of their heritage. thanks for the enlightenment! i watched the movie dead lands and watch the haka “moves” and try to search for the meaning, so curious ang i really like it. its merely self promoting theatre and it means zero to those they oppose? if opposition teams did their own version it would simply “melt way”=please!!! I have never seen this kinda of dance but something about it moved me. It made me feel a mix of emotions. It’s crazy to me that I should feel like this over something I never know existed. I did some research on it and I began to understand it a little more. The one I saw was one at a Wedding. I wanted to cry but of joy and happiness for the couple. I didn’t know them but it sure moved my soul. All I know is that this is the best pre war cry ever. I would like to know more about it. It’s amazing to see how people feel in the inside by showing there own expressions. F*ckin awesome things here! Thank you so much and I am taking a look forward for more. you wrote that “It is not exclusive to Māori; anyone is welcome to perform a haka.” but I’ve heard people say it’s often performed by Maoris but under special occasions or with permission the haka can be performed by others such as students in schools or the non-Maori All Blacks members. Is that true? Do the people living over in the Middle East (Muslims) do this kind of dance? I only ask because I thought I seen a video of a bunch of Muslims doing this as our troops were coming in. The haka is a type of ancient Māori war dance traditionally used on the battlefield, as well as when groups came together in peace. But I also see ads of Haka noodles which is absurd.